The Circuit Judges were made in a cooperative effort between Rossi and Taurus. Starting with the most overwhelmingly successful revolver in recent history and has extended its range for incredible hunting and target shooting. 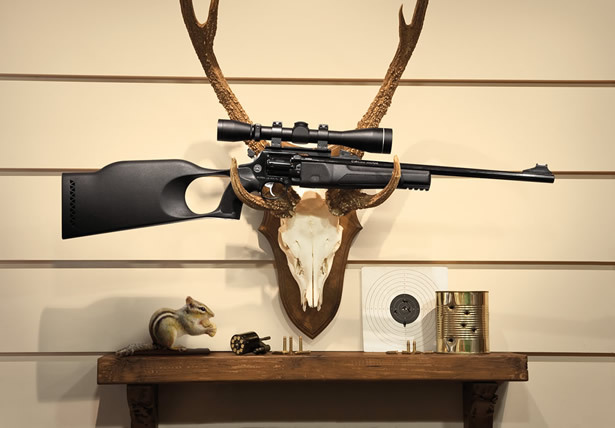 The Rossi Circuit Judge .22LR/.22 Magnum gives you the versatility and speed you need. It easily transforms from .22LR to .22 Magnum in seconds with its breakthrough removable cylinder. It’s everything you could ever want for plinking, target practice or varmint hunting with these popular and affordable ammunition choices. For some time I had been searching for a .22 revolver. Nothing special really, just a basic plinking pistol to have some fun at the range. I had also been interested in something that would shoot .22 Magnum rounds. But what I really wanted was something that could shoot both. I looked at quite a few different handguns and rifles to find something that would fit the bill. Mostly at revolvers and lever-action rifles since those interested me the most. None of them really fit the bill. Then I came across the Rossi .22LR/.22 Magnum Circuit Judge. It was just sitting there in a rack at one of my local gun shops. I asked the guy behind the counter to take it down and let me have a look at it. Once I held it in my hands, I was hooked. It was everything I was looking for and more. I had to take it for a test-drive. The Rossi .22LR/.22 Magnum Circuit Judge is certainly not for the faint of heart. Those that consider blowing up a car with a 20mm cannon or turning a refrigerator into Swiss cheese with a Gatling gun as plinking, well then you will surely be disappointed. Now I am surely not saying either would not be an experience like no other. I am simply keeping my goal of a fun to shoot plinker in perspective for this review. What first drew my attention to Rossi’s Circuit Judge was it’s unique look. The idea of a 9-shot .22LR/.22 Magnum revolver with an 18.5″ barrel mounted to a rifle stock definitely draws a lot of attention. The black synthetic stock is lightweight, comfortable and durable and the bright red and green Fiber Optic sights are easy to see. I expected to hear a lot of ooohs and ahhhs from anyone that catches a glimpse of it. The Rossi Circuit Judge is available in many flavors including a 28 Gauge shotgun, a .44 Magnum and a 410 Gauge Shotgun/ .45 Colt combo in addition to the .22LR/.22 Magnum model that I am reviewing here. The complete list of them can be found here. The stock and forearm are made from a lightweight, weather-resistant synthetic polymer that is non-marking and very durable. In the tail-end of the stock there is a small storage compartment behind a removable panel where you can store up to nine-rounds of spare .22LR or .22 Magnum ammunition with a clear plastic window on the left side of the stock allowing you to see how just many rounds are left. The forearm contains an accessory rail that is perfect for mounting a flashlight. This .22LR/.22 Magnum revolver features two 9-shot interchangeable cylinders allowing you to alternate between .22LR and .22 Magnum cartridges. This change can be made very quickly. 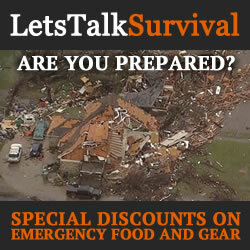 It only takes a few seconds and absolutely no tools are required. The forearm contains a quick-release tab. When depressed, the forend will unlock and can be slid forward along the barrel. Once the forearm is sitting in the forward position and the cylinder has been opened, simply depress the button located on the right-side of the frame, just above the trigger guard. This will release the cylinder and yoke allowing it to be detached from the frame. Simply reverse the process to lock in the alternate cylinder and the rifle is ready to go again. The Rossi Circuit Judge provides gas-deflector shields located on both sides of the frame and cylinder, near the cylinder gap. These shields will prevent any nasty burns to the arms and hands of the shooter that could occur as hot gas escapes between the cylinder and the barrel. This was certainly a problem with early revolving carbines while supporting the barrel, as you would with other long guns. But this is not much of a concern when firing a revolving handgun since both hands would be behind the cylinder and barrel gap. The Rossi Circuit Judge incorporates a swing-out style cylinder with 9 (nine) chambers. The hammer cannot be cocked and the trigger cannot be pulled without the cylinder being locked into place. Shots may be fired using the single action (cocking the hammer prior to pulling the trigger) or using the double action (simply pulling the trigger). Both single and double actions cause the cylinder to advance, aligning in succession, each of the chambers with the barrel. The Rossi Circuit Judge is also equipped with an 18.5″ blued steel barrel, bright red and green Fiber Optic iron sights and a Weaver-style scope rail. In addition, a hammer extension is included in the box. The Rossi Circuit Judge also sports the exclusive Taurus Security System. It is designed to preclude the use of the firearm when the mechanism is engaged. It is an integral mechanism located in the hammer itself. The Fiber Optic sights are bright and very easy to see, even in moderate-light situations. Especially against black targets and silhouettes. However, the red front sight can easily get lost on an orange or red target or bullseye. Adjusting the sights is a rather simple process. The direction in the manual are clear and easy to follow. 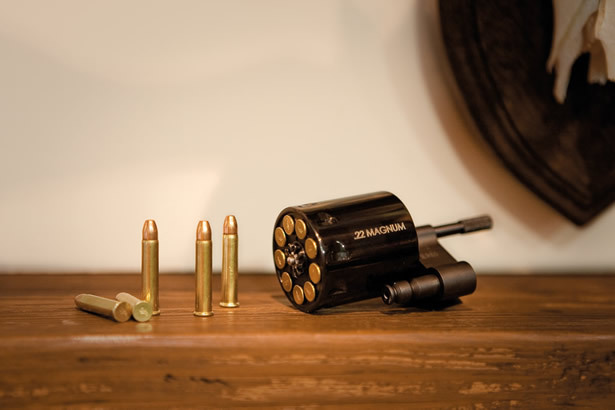 Changing between the .22LR and .22 Magnum cylinders is quick and painless. It only takes a few seconds to swap the cylinder out. However, it is not as fast as using a speed loader so having extra cylinders just for the sake of reloading would not be beneficial or cost effective. While loading either the .22LR and .22 Magnum cylinders, the rounds fit snugly. The ejector rod positively ejects the spent casings and unused ammo with ease. Due to the oversized forcing cone and narrow gap between the cylinder and barrel, there will always be some smoke and blow-back that occurs as the bullet passes from the cylinder into the barrel, and then out through muzzle. Thankfully, the gas-deflector shields do their job and block all of the hot gases that would otherwise be directed downward. It is expected that there will always be some loss of bullet velocity when it comes to a revolver simply due to the gap between the chamber and barrel coupled with the need for a larger forcing cone to “catch” the bullet as it passes from the cylinder to the barrel, prior to connecting with the rifling. Normally, this loss is somewhat negligible. However, in this case, the tolerances seem to be quite low allowing additional gases and pressure to escape. While this firearm has proven to be perfectly safe to use, it probably would not work well for competitive shooting. I think that the loss of velocity is certainly not great enough to detract from any of the fun you’ll be having. Besides, a big cloud of smoke every so often only adds to the experience. Right? The double-action pull is long and smooth, although it feels far too heavy for me out-of-the-box measuring more than 12 pounds of resistance. I would prefer it to be quite a bit lighter. 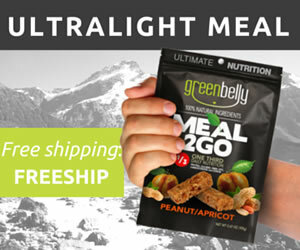 The single-action pull is very short and crisp to fire measuring just a little over 5 pounds of resistance. I prefer using the single-action for target practice. I found I was much more accurate without the long, heavy pull of the double-action. Additionally, the single-action of the Circuit Judge vastly slows down the use of ammo. With the cylinders removed, this firearm is open and very easy to clean. Probably one of the easiest and most enjoyable firearms I’ve had the opportunity to clean as of late. And the best part, no tools are required to break it down at all. Now its time to do some shooting. While I would have liked to test this firearm at an outdoor range where I could have tested the accuracy at both 50 and 100 yards, my local indoor range was all I had time for, thus limiting the testing to 25 yards or less. However, I may update this article in the near future if I can make it out to the outdoor range soon. For the first accuracy test, I will be using a few boxes of old CCI Long Rifle Blazers that I’ve had lying around for a while now. I would have liked to use some fresh ammo [like maybe from this century] in a few different brands. However, since I have been running a little low lately like many of you out there, we’ll just use what I’ve got on hand for this one. I spent most of the first box of 50 just getting a feel for the trigger, action, weight, stock and iron sights. 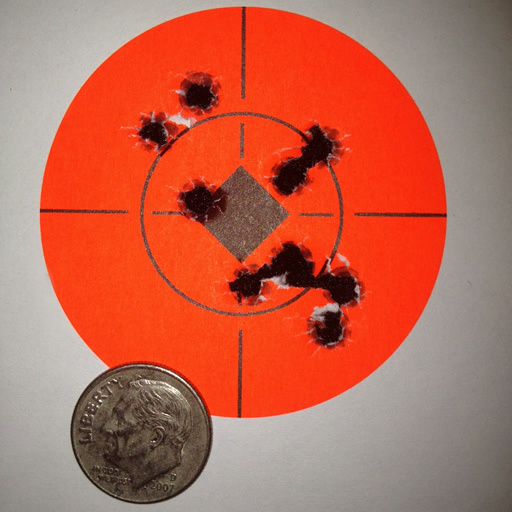 Once I felt comfortable enough with the rifle, I was able to consistently put all 9 shots within in 1.5″ diameter group at a distance of 25 yards using the single-action. I was pretty happy with the out-of-the-box accuracy and what I was able to achieve just using the Fiber Optic iron sights. The next set of tests were performed using an inexpensive Center Point 3-9x40mm scope set to the power of 4. 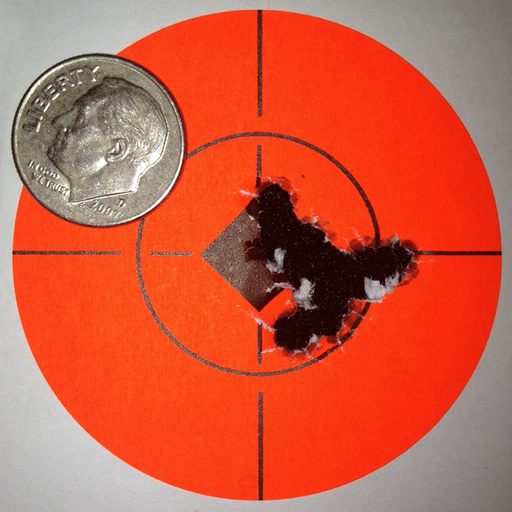 After zeroing the scope, I was able to consistently put all 9 shots into a small .75″ at a distance of 25 yards. Again, using the single-action. I was genuinely surprised at the level of accuracy that I was able to achieve with this rifle, a cheap scope and some old ammo. For the final set of testing that I performed, I used some fresh Remington 22 Thunderbolt ammo that I had purchased in a cheap bulk box. The experience was reminiscent of shooting an old black powder muzzle-loader. The smoke cloud was ridiculously thick and the delivery was very inconsistent. I had trouble keeping the rounds within a 1.5″ circle at 25 yards. I would certainly not recommend this ammo to anyone at all. I’ll surely have to try this firearm with some fresh match-grade ammo as well as some Magnum loads to see if I can improve on the accuracy even further. I’ll be sure to update the article as new information becomes available. Some have commented on the huge forcing cone tolerances and lack of quality control with many of the various Circuit Judge models. But hey… I think most enthusiasts who have owned Rossi Firearms in the past understand that you don’t typically look to Rossi Firearms for the highest quality, precision machining, tolerances and polish. Now I am not saying that Rossi does not make good, solid products. I have owned many Rossi firearms over the years. However, I do find that the quality is certainly not at the same level as the Browning or Smith & Wesson firearms I have had in the past. With that said, I am pleased to say that there were no malfunctions, jams, failures to fire or ejection issues during the entire testing process. The reliability of this firearm has been superb thus far provided you use decent ammunition. I think Rossi really hit a home run with this ultra-reliable, lightweight plinker. It was designed to be a fun gun and that is just what it is. If you ever get the chance to check one of these out for yourself, I am certain you will enjoy every minute of the unique shooting experience like I did. I for one can’t wait to get back out to the range with one again myself. In December of 1997 BrazTech International L.C. was created as the exclusive importer of Rossi firearms in North America. Previously, Rossi firearms were distributed by Interarms of Alexandria, Virginia. 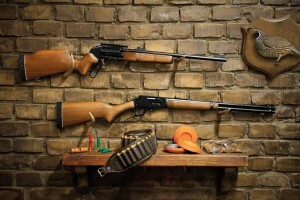 Rossi manufactures its classic rifles in a plant in San Leopoldo, Brazil and will continue operations there, selling many firearms outside the United States and North America. Today’s Rossi is still run by the same family and they put the same dedication and innovation into every firearm. 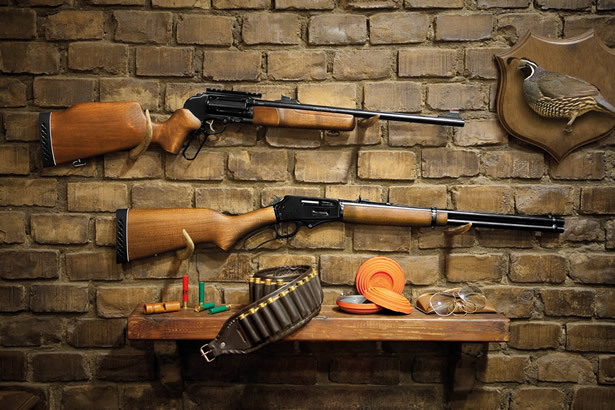 At Rossi, it is more than just building guns…it is a family’s history and tradition.